If this is correct and @maryss is almost always correct despite this being an awesome field I think it’s very favorable for our wisconsin studs as clearly their are plenty of great runners in this field but enough of the top runners are also missing to give wisconsin a good shot at sending 3 kids again. The top guys from colorodo and Minnesota will not be running. A few of the top Ohio runners with sub 15 prs are not running (they have very fast 1600 prs as well), I would say 3 out of the top 4 in Ohio are not running and this is a huge deal. I think the fact that Ohio doesnt seem to be in this field other than the kid who on a downhill course broke 14:30 (after maybe being the fastest of all 50 states as a group during the season) really opens up this race. Their will be at least 5-6 studs that if they are ready to run will make it (Bosley is included of course) but it’s harder to predict who is still in shape at this point (for example gabe fendel who did not run well at Nike). The final 3-5 spots are definetly open for athletes that run a special race and put themselves in position with 800 to go. Another guy running is Badger signee Shuaib Aljabaly (14:53). He’s the Michigan D2 champ, running 15:12 to beat Comerford by 12 seconds. Foster, Johnson, Grzymkowski and McKinley went 1-2-3-4 in Michigan D1 in 15:16, 15:18, 15:18, 15:23. That looks to have been a heck of a race. FLMW is going to be the race of the year in these parts. There are going to be absolute top quality guys finishing mid-20’s. Where did you see these? Check entry is on left side of page. @Biff Jacobs didn’t have an amazing freshman year but clearly he was positive enough on the program and prospects to concvince this fine athlete to go to the badgers. Yes I missed him good find (I put him in my rankings instead of the other guy post hoc on your call I usually don’t adjust rankings so giving you credit for that), I didn’t really review Michigan but they usually have 1-2 guys in the top 10. Glad he is going to wisconsin. Have you checked his track prs by any chance. The Ohio kids were the animals in track but many didn’t sign up I think their season was intense with so many races at 15 flat or faster but I think their top 2 guys aren’t here and 3 out of their top 4 so that should help the field from being completely out of control as it is still an awesome field. It will be dry this week and the high on Saturday is forecast for 40 degrees. I predict 17:10 and 14:58 for the wins and 17:40 and 15:11 will be 10th. It is unfortunate that some really good runners will probably run 18:00 and 15:20 and only finish 20th place. I think WI has three that for sure can run under 15:10 and qualify as well as another three that could achieve that mark on a great day. We are loaded this year. outside the box thinking for the talented: it’s only about 15 minutes if you do it right! It is really difficult to predict the top 10 due the number of great runners competing this year and due to the inconsistent results from NXR to Footlocker in previous years. Some runners wake up after NXR and some qualify for NXR and then disappear at Footlocker. I am not as confident in my predictions as usual but I enjoy putting something out there for possible bragging rights. I knew that people wouldn’t be happy that I didn’t put him finishing 1st so I tried to list him twice. Actually, I was moving info from phone to computer and pulled the incorrect WI guy for 8th. I predict Meinke for 8th. I think Schiek will be in the lead at the halfway mark but will fade. I think there will be 25 guys in the mix for 10th place at halfway. I will make predictions for girls tonight. I am more confident with these predictions than I am for the boys. I left Lauren Ping out because I don’t believe that she is eligible to compete in the championship race. Grace Ping is a national talent but she has been injured so I pushed her in getting 10th. Even without Lauren, I included many MN girls. For the girls, 17:50 is about what it has taken to qualify in the past. 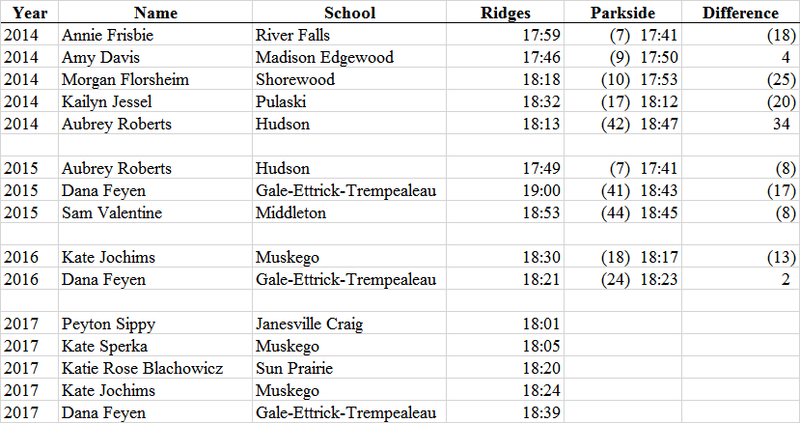 Here are some comparisons from times run at Ridges and then at Parkside in the 5K era. The 2017 names are all registered. Meghan Scott not being entered is a surprise after making the trek to Yankton and running well there. Consider that usually, dry Parkside is much faster than Ridges. In 2014 Parkside was a snowy, muddy run and most of the runners you listed still ran faster at Parkside.